It all started with two Ebola cases in Foya, Lofa County. It was on March 17 of this year that the Ebola virus entered Liberia from Guinea. The reaction of the government of Liberia on the arrival of the virus was one of indifference, with hindsight we now say, recklessness. 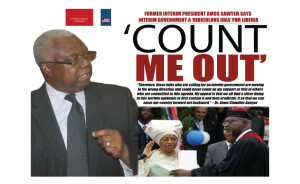 President Sirleaf did not change her agenda and left the country for a foreign trip. However, it was known from previous outbreaks – in the Democratic Republic of Congo, Uganda, Sudan – that the Ebola virus is very aggressive and contagious and that the fatality rate of this killer-disease exceeds 90%. A month or so later, the disease appeared confined and under control. Then, on May 25 another outbreak of Ebola was reported, again in Foya. This time the virus came from Sierra Leone. The initial reaction of the government was not much different from the one in March-April – even though the virus had already led to the death of a number of health workers during the first ‘wave’ of EVD (Ebola Virus Disease) since they worked without sufficient protection and were not at all trained and/or prepared to handle this highly contagious disease. This second wave of EVD was much more serious than the first one. It took, however, nearly two months before the government took action, declaring a National Health Emergency and creating a National Health Force on July 26. This was followed by a State of Emergency on August 6, a curfew on the 19th and the infamous quarantine of ‘West Point’ the following day. Protests were quelled by the Liberian Army and police forces and their shooting led to the death of at least one person, 16-year old Shacki Kamara. President Sirleaf cancelled all her trips abroad including her participation in the huge US – Africa Leaders Summit early August. By the end of August the death toll of the epidemic, now completely out of control, exceeded 1,000 casualties of which 80% in Montserrado, Lofa and Margibi. But Ebola, initially ‘limited’ to Lofa County, Bong and Montserrado, had now spread to all counties, with Monrovia being the only capital in the region with rising Ebola cases. Official figures, however, hide a painful fact: under-reporting. After initially denying the existence of Ebola and accusing the government of a plot, the population gradually became aware of the aggressive nature and existence of the virus. Cases of locking up sick people and illegal burial of suspected deaths became known. Moreover, the capacity of public health services responsible for collecting dead bodies proved insufficient and dead bodies lingered in the streets for days before being collected thus creating another health hazard. I do not intend to tell here the whole sad story of how Ebola developed into a nightmare for the Liberian people. Newspaper articles abound with details. Here I want to draw attention to the fact that the Liberian Government’s failure to adequately address the epidemic is no case of force majeure. The situation is beyond the control of the government because of its failure to create a viable, efficient and effective public health sector ànd because of the huge gap between the Government of Liberia – still perceived by many as consisting of an elite who only thinks of its own interests – and the population. The 2013/2014 National Budget included total public expenditures amounting to US $ 583 million but only US $ 70 million had been allocated to the health sector. This sharply contrasts with the planned expenditures for ‘Public Administration’ which includes the National Legislature, the Ministry of State for Presidential Affairs, the Ministry of Finance, debt service: US $ 185 million or some 30% of total expenditures. President Sirleaf can be proud of realizing the cancellation of the country’s huge foreign debt – US $ 4.6 billion – and attracting some US $ 20 billion in foreign investments, two major achievements (though much more could – and should – be said about these FDI but that is beyond the scope of this post). However, President Sirleaf’s handling of the Ebola crisis has led to much criticism, even voices have been heard that she should step down, ‘lead or quit’, and the call for the creation of an interim-government. Criticism is voiced both by Liberians inside the country and by Liberians in the diaspora. Also the USA and international organizations like MSF/Médecins Sans Frontières (Doctors without Borders) and even the UN have criticized the Sirleaf Administration. The Ebola crisis acts as a wake-up call. Africa’s first democratically elected female president is losing her popularity – both inside and outside Liberia. It will take months and many more deaths before an end will be in sight of the Ebola epidemic. But the plague also has severe social, economic and political consequences which will gradually or abruptly become visible. One of them is a governance crisis. Since the creation of the republic ordinary people have had no confidence in ‘their’ government – which was not ‘their’ government at all, at least until 1980, but also after that date, marked by the military coup of master-sergeant Samuel Doe – and this still is the case. Mistrust and lack of communication characterize relations between the government and those who are being governed. Moreover, many Liberians have become disappointed with President Sirleaf because of the nepotism and corruption that have become trademarks of her Administration. Meanwhile, the Liberian Government lacks the funds, the manpower and the expertise to fight the Ebola epidemic and to bring it under control. Liberia not only depends on foreign capital to develop the country and on foreign troop to keep the peace, Africa’s oldest republic now also needs foreign assistance to contain and eradicate Ebola. The following statement is merely meant to illustrate the sentiments and ideas that live in the Liberian Diaspora. It is a statement by the Liberian Association of Metropolitan Atlanta (LAMA). The paper consists of four parts. First, it examines the manner in which the Sirleaf Administration has handled the Ebola epidemic. Secondly, it focuses on what is called the governance deficit of the Liberian Government. Thirdly, it lays out some maor aspects of the crisis of socio-economic development and forthly, the statement offers some suggestions for addressing the Ebola crisis, and broader issues like democratic governance and socio-economic development. The current Ebola crisis in Liberia has laid bare the stark reality that the perennial governance and human development deficits in Liberian have widened during the administration of President Ellen Johnson Sir leaf. The central piece of evidence is based on the “I don’t care” attitude and the demonstration of insensitivity to the plight of Liberians by President Sirleaf since the outbreak of the Ebola crisis. This has shocked many Liberians and various sectors of the international community that had invested tremendous amount of hope in the Sirleaf regime. President Sirleaf entered office on January 16, 2006, amid a wave of hope and optimism both in Liberia and abroad that she would have provided the requisite human-centered leadership that is imperative for the building of a new democratic and prosperous Liberia for all Liberians, irrespective of their ethnic, regional, class, gender and religious backgrounds. This hope was shaped by two major factors. First, it was believed that President Sirleaf would have brought to bear on the leadership of Liberia the experiences she has gained from her tenure in various positions in the Liberian government, the United Nations, the World Bank and the private sector. Second, it was thought that President Sirleaf would have taken concrete steps to correct the country’s governance and development problems, since she had been a very vocal critic of the Tolbert, Doe and Taylor regimes. At the international level, the investment of hope in the Sirleaf regime was significantly reflected in the unprecedented increases in the flow of development assistance from the European Union, the United States Government, and others. In short, the Sirleaf regime was the beneficiary of tremendous goodwill. Unfortunately, after being in power for almost nine years, the repository of evidence clearly shows that the Sirleaf regime has betrayed the hopes of Liberians and the international community by its horrendous performance in the twin areas of democratic governance and development. Against this background, the purpose of this Position Statement is four-fold. 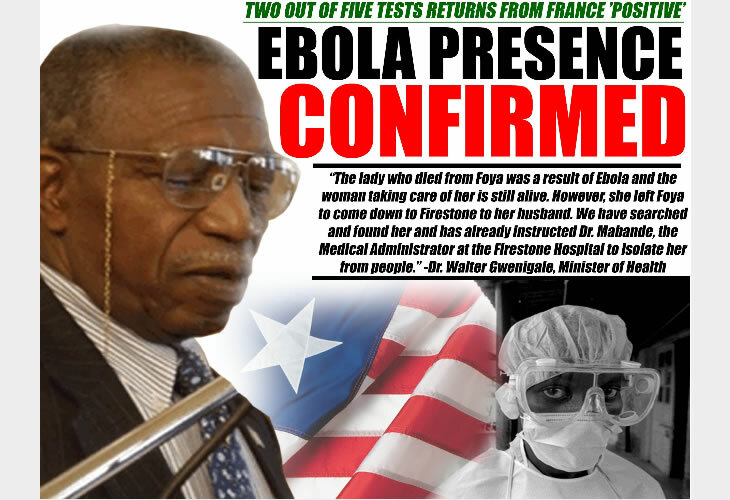 First, it will examine the poor manner in which the Sirleaf regime has handled the current Ebola crisis. Second, the statement will map out the growth of the governance deficit under the Sirleaf regime. Third, it will lay out some of the major aspects of the crises of socio-economic development. Fourth, the statement will offer some suggestions for addressing the current Ebola crisis, and the broader crises of democratic governance and socio-economic development. The outbreak of the Ebola virus began in Liberia in March 2014, as a result of its spread from neighboring Guinea. Characteristically, the Sirleaf regime responded to the initial outbreak with the usual “I don’t care attitude.” This was reflected in two major ways. First, the Sirleaf regime made virtually no effort to take the requisite measures that were imperative for containing the spread of the virus. Second, in a classic display of the lack of commitment to the survival of the Liberian people, President Sirleaf insisted that she had a planned trip to Equatorial Guinea, prior to the initial outbreak of the virus. Hence, she was leaving the matter to the Ministry of Health. So, she made the trip to Equatorial Guinea, amid the looming threat of the Ebola virus to the lives of the Liberian people. This action by President Sirleaf was a clear demonstration of the fact that while she is interested in the pageantry of the presidency, and in the control of the state’s economic resources, which she has allowed her relatives, friends and government officials to plunder and pillage with impunity, on the other hand, she has no interest in performing the most important responsibility of her office: the protection of the lives of the Liberian people. 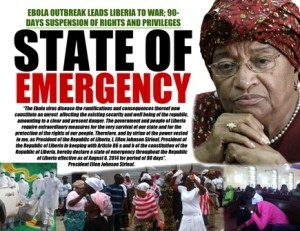 Beyond the demonstration of the lack of care and commitment to the well-being of the Liberian people, the outbreak of the Ebola virus exposed the fact that the Sirleaf‘s regime has not developed the requisite mechanisms and formulated the required protocols for dealing with health crisis. And this was clearly reflected in the lack of direction that characterized even the regime’s initial token response to the outbreak of the virus. 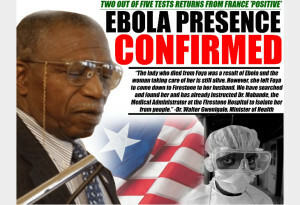 Clearly, these attitudes and actions on the part of the Sirleaf’s regime contributed to the spread of the virus. Tragically, it was only after the international community raised an alarm about the rapid spread of the virus that the public image-obsessed Sirleaf’s regime decided to take some belated actions. 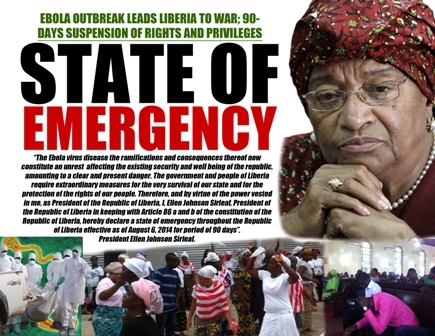 First, on August 6, 2014, President Sirleaf declared a “state of emergency” for three months. However, as usual, her regime failed to consider the implications of the “state of emergency” for the Liberian people’s access to food, water, and other basic necessities of life, including health care. Second, on August 19, 2014, President Sirleaf imposed a nation-wide dusk to dawn curfew. Again, the ramifications of this policy action for the lives of the Liberian people were not carefully thought out. Third, on August 20, 2014, Liberian soldiers fired on unarmed and defenseless citizens in West Point, the largest slum in the country with an estimated population of 50,000 people squeezed on a land mass that is about half a mile long. As part of the measures under the “state of emergency,” West Point is one of the communities that are under quarantine. But, as has been discussed, the Sirleaf regime’s decision to impose the quarantine did not take into consideration issues such as the residents’ access to food and the other basic necessities of life. In addition, as a slum, West Point does not have lavatories and pipe borne water in its predominantly uninhabitable “houses” that are predominantly made of corrugated zinc. Hence, the residents use the beach as a lavatory facility. Thus, frustrated by the poorly designed and implemented quarantine by the Sirleaf’s regime and its adverse effects on their livelihood, some of the residents of West Point decided to protest. And this led to clashes with troops from the Armed Forces of Liberia, which resulted in needless injuries. In sum, if the quarantine had been well designed and implemented against the backdrop of the unfortunate realities in West Point, this violent confrontation would have been avoided. Thankfully, amid the demonstration of the lack of vision, concern and care for the Liberian people, as well as the gross incompetence of the Sirleaf regime, various sections of the international community, including the Doctors Without Borders and the United States Government(through its Center for Disease Control) have intervened to help contain and prayerfully address the Ebola virus. Undoubtedly, the very poor manner in which the Sirleaf regime has handled the Ebola crisis demonstrates that the Liberian people cannot rely on their government for the protection of their lives. Accordingly, for the majority of Liberians, the Sirleaf regime has become an irritant that needs to be challenged. As has been discussed, President Sirleaf assumed office amid the heaping of various accolades on her, including “the Harvard-educated economist” (but, the fact is that she is not an economist; she studied public administration), and “experienced.” In addition, in her first Inaugural Address delivered on January 16, 2006, she promised to provide the critical leadership in building a democratic and developed Liberia in which, among other things, there would be no tolerance for corruption, mismanagement and incompetence. Unfortunately, President Sirleaf has failed to match the high expectations and rhetoric with practice. And this failure has resulted in the widening of the governance deficit that has bedeviled Liberia since its founding in 1847. At the core of the continual governance deficit is the fact that the Sirleaf regime has failed to articulate and implement a people-centered national vision for building a new democratic and developed Liberia. 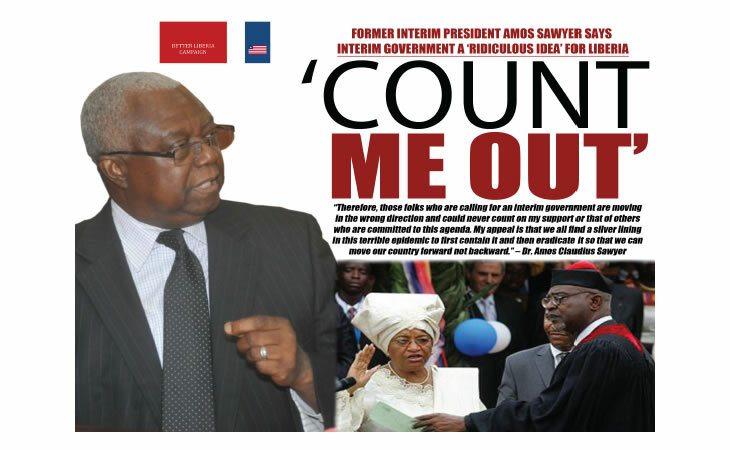 Instead, the Sirleaf regime has thrived on shallow clichés and “sound bites” that are ostensibly designed to bamboozle and placate the international community. Regrettably, initially, she did succeed in fooling the international community in large measures. And this was reflected in several ways. President Sirleaf received many awards for things that she did not accomplish. For example, in 2007, President Bush awarded her “The Presidential Medal of Freedom,” the United States’ highest civilian award, for her contributions to the struggle for democracy in Liberia. On the contrary, the fact is that President Sirleaf was a member of the oligarchy that misruled Liberia for decades. Moreover, she only had a so-called “pro-democracy moment,” when she referred to the late President Samuel Doe and the officials of his government as a “bunch of fools and idiots,” in the keynote address that she delivered at the National Convention of the Union of Liberian Associations in the Americas, held in Philadelphia, Pennsylvania, in 1984. Again, in 2011, to the great surprise of many Liberians, she was awarded the Noble Peace Prize. But, the reality of the matter is that she has never been an agent for peace in Liberia. Two cases are quite instructive: in 1985, she was one of the key players in the abortive military coup that was led by the late Gen. Thomas Quiwonkpa against the Doe regime. Four years later, she was one of the principal supporters of the Taylor-led insurgency that led to the first Liberian civil war in 1989. Also, the Sirleaf regime, has been discussed, received millions of dollars in development aid from various international organizations and countries for various projects. But, characteristically, the money received was instead used to enrich President Sirleaf, members of her family, her friends, associates, and officials of her government. Another major problem is the vexing issue of rampant corruption. Corruption has become very pervasive under the Sirleaf regime to the extent that is commonplace in the legislative, executive and judicial branches of government. Specifically, public officials are using various corrupt means, including the receipt of bribes and extortion, to enrich themselves. For example, the awarding of concession agreements to various multinational corporations, and oil blocks to several energy-based firms has provided “golden opportunities” for President Sirleaf, members of the National Legislature, relatives, friends, and other officials of the Liberian government to receive bribes. Importantly, the pervasiveness of corruption under Sirleaf’s regime has earned Liberia the dubious distinction, based on Transparency International’s annual ”corruption index,” as one of the most corrupt countries in the world. In sum, as an active participant in the corruption saga, President Sirleaf lacks the moral authority and the political will to lead the required onslaught against this scourge that continues to deprive the Liberian people of decent livelihoods. Also, the Sirleaf’s regime has become quite notorious for the mismanagement of Liberia’s financial resources. Several cases are instructive. President Sirleaf has wasted millions of dollars from the public coffers on her frequent international travels. In fact, she has made more trips abroad than any of her predecessors: she travels abroad one or more times virtually every month. In addition, she takes along a very large entourage on each of her trips, thereby requiring the spending of millions of dollars for air fares and per diem. In fact, the frequent trips that are made abroad by President Sirleaf provide another corrupt method through which her friends and government officials are able to make money through the receipt of exorbitant per diems and other financial perks. Furthermore, millions of dollars from the public coffers are being wasted on the very high salaries of various government officials, including members of the National Legislature. For example, some cabinet ministers and heads of autonomous agencies and public corporations are being paid between $10,000 to in excess of $20,000 per month! As for the members of the National Legislature—the House of Representatives and the Senate—, they are being paid base salaries in excess of $10,000 per month. In addition, they receive generous allowances for housing, the purchase of cars and telephone cards plus free gasoline allotments per month, among others. This is mindboggling for a developing country that is especially trying to recover from two civil wars! Moreover, the Sirleaf’s regime has continued the perennial practice of spending public funds to purchase cars for government officials at various levels, and to provide them with monthly allotments of free gasoline. Sadly, the money that is so desperately needed for education, health care, food production, clean drinking water, sanitation, electricity and the development of the physical infrastructure is being mismanaged on needless presidential travels abroad and high salaries, allowances and other perks for government officials. So, this is why having a government job is a “life and death struggle” in Liberia- because it is the easiest way to get rich quickly without any risk! As well, despite her criticism of the late President Tolbert for engaging in nepotism, President Sirleaf has outdone her predecessor by continuing and expanding the practice of the “government by, for, and of family members.” For example, some of her children and relatives are holding various high-leveled positions in her regime. Undoubtedly, there are other Liberians with much more impressive credentials and wealth of experiences, who could occupy the positions that are currently being held by President Sirleaf’s relatives. In spite of its rhetoric, the Sirleaf’s regime has failed to make the required public investments in the improvement of human development. And this has made the perennial human development crises worse, as reflected in various indices. For example, more than 60% of Liberians are living below the poverty line. To add “salt to injury,” scores of Liberians are so impoverished that they cannot afford even one meal per day. The pervasive condition of mass abject poverty is exacerbated by high unemployment. By some accounts, Liberia has an unemployment rate of more than 90%. Then, there are growing inequities in wealth and income between the “haves” and the “haves not.” That is, few individuals have all of life’s basic necessities, thanks to the pillaging and plundering of state resources, while the majority is deprived. In terms of health care, there is a total collapse of the public health care system, as evidenced by the inadequacy of medical personnel—doctors, nurses, etc.—, medical facilities, equipment, supplies and medication. This has led to the deaths of several Liberians from curable diseases, and the misdiagnosis and mistreatment of illnesses. In fact, the Sirleaf’s regime has continued the practice of the government’s perennial neglect of public health. This is because, like previous regimes, President Sirleaf, her relatives, friends and government officials do not use the local public health system. Instead, they use the state’s money to attend to their health care needs in Cote d’Ivoire, Ghana, South Africa, the United States, and other countries. Similarly, there is the inadequacy of clean drinking water and acceptable sanitation. For example, Monrovia, the capital city, is littered with trash and filth. These conditions have made Liberians vulnerable to diseases. In fact, the very unsanitary environment provides a very conducive atmosphere for the spread of the Ebola virus. Likewise, the public educational system—from the primary to the tertiary level—is in total shambles. For example, there is the inadequacy of trained and competent personnel, especially teachers, the number of schools, instructional materials, including books, chairs and desks, equipment and supplies. Two of the major resultants are the high rate of illiteracy, and the poor preparation of students. A major case in point is that virtually all of the high school students, who take the entrance examination for admission to the University of Liberia every year, often fail en mass. This troubling trend is a reflection of the inadequacy of the preparation these students receive at their respective high schools. In short, “unprepared teachers are teaching unprepared students. In addition, the country has been without electricity for almost 25 years! Hence, the current source of electricity is generator (for those who can afford it). Furthermore, the country’s roads, for example, continue to be in deplorable condition. This was, for instance, the main reason why the celebration of the country’s 167th Independence Anniversary on July 26, 2014 was not held in the southeastern region. In sum, the country’s overall physical infrastructure continues to be very underdeveloped, thereby making travel and other activities extremely difficult. After almost nine years in office, the Sir leaf’s regime has failed to address these important development issues. In fact, in most cases, these issues are getting worse. For example, the failure to adequately repair, and construct new roads has made it even more difficult for travel from one part of the country to another (even relatively short distances). A. The improvement of the methods of identifying those who are infected with the virus. B. The improvement of the facilities for quarantine. C. The use of caring and sensitive methods of quarantining those who are infected. D. The need to work with communities and citizens in formulating and implementing ways to balance the need to quarantine infected individuals and communities with the need for people to have access to food and other basic necessities of life. E. The improvement of public education and awareness about the virus. G. The mobilization of financial, material and medical resources to help contain the spread of the virus, and to treat those who have been affected. A. The Sirleaf regime would need to change its “I don’t care” attitude, and overall lack of commitment to the advancement of the welfare of the Liberian people. B. There is the need for the formulation and implementation of a human-centered national vision that would put the collective interests of the Liberian people above personal ones. D. End the mismanagement of public financial resources by curtailing the number of presidential trips abroad, reducing the size of the presidential delegation on each trip, the formulation of a salary structure for public officials and employee that is aligned with the cost of living and the other economic realities of Liberia as a developing country, the elimination of allowances for the members of the National Legislature, the monthly gasoline allotments to public officials, and the purchase and assignment of cars to government officials, the need to end nepotism, and the imperative of appointing only qualified individuals with the requisite credentials and experiences to various government positions. 3. The Crises of Development: The government would have to make major public investments in health care, education, access to clean drinking water, acceptable sanitation, and the other areas of human development, and the physical infrastructure, including the repair of existing roads and the construction of new ones, and the provision of electricity nation-wide. Finally, one does not need to be a “rocket scientist” to reach the conclusion, based on the overwhelming body of evidence, that Liberia is now a “failing state” that is characterized by multidimensional crises—the Ebola crisis as part of the larger health care crises, mass poverty, high unemployment, low standard of living for the majority of Liberians, growing inequalities in wealth and income, the inadequacy of public education, clean drinking water and sanitation, food insecurity, the lack of electricity and running water, and an overall poor physical infrastructure. To make matters worse, the country is suffering from a crisis of leadership as well, because the Sirleaf’s regime has performed very poorly. In order to rescue Liberia, it is absolutely critical for Liberians to speak out against the poor performance of the Sirleaf’s regime, including its poor handling of the Ebola crisis, and to be actively engaged in helping to find solutions to the country’s many problems. Yes, the international community can help; but, ultimately, it is only Liberians themselves, who can change the course of their country’s history, by working together to build a new democratic and prosperous Liberia, based on patriotism, national unity, commitment, a national vision, democratic governance, accountability, transparency, integrity, honesty, and pluralism. Issued this 23rd day of August 2014, by the Liberian Association of Metropolitan Atlanta at its headquarters in the City of Lilburn, the State of Georgia, United States of America.